Does your kid know how to mail a letter? You don't drop it in the mailbox before sticking the stamp on it, now do you? Make sure he can get it right with this fun worksheet where he labels which steps go first, next and last. What's next? Last! Click here for the last worksheet in this series! Can she label each step in the sequence as first, next or last? In this worksheet, she'll label each picture as first, next or last. Help him cut out the scenes and decide what happens first, next and last. 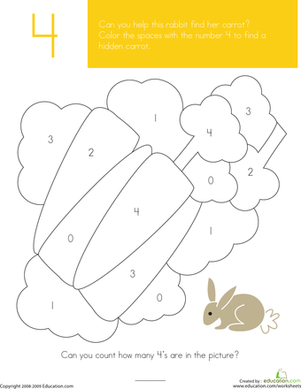 This preschool math and coloring worksheet focuses on the number 4. Kids color all of the spaces with the number 4 to reveal a hidden carrot picture. Help your child develop her early problem solving skills with this pattern practice sheet, where she'll decide which item comes next in each sequence! Can you create the number 4 out of these shapes? 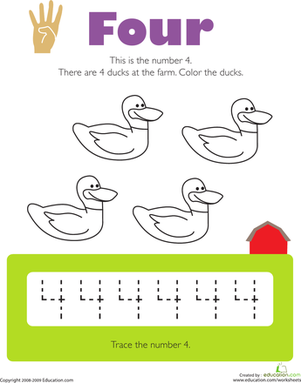 Kids color four ducks and trace the number 4 several times to practice counting, identifying, and writing numbers on this prekindergarten math worksheet. 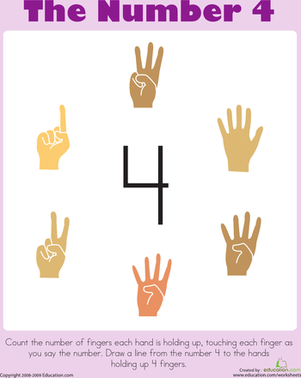 Kids count the fingers being held up on each hand and draw lines from the number 4 to the hands raising four fingers on this prekindergarten math worksheet.